Nigeria's Patron Saint Is St. Patrick, Thanks To The Influence Of Irish Bishops : Goats and Soda The Irish have a long history in the country. And in case you were wondering, Guinness stout is the second most popular beer. How Did St. Patrick Get To Be The Patron Saint Of Nigeria? 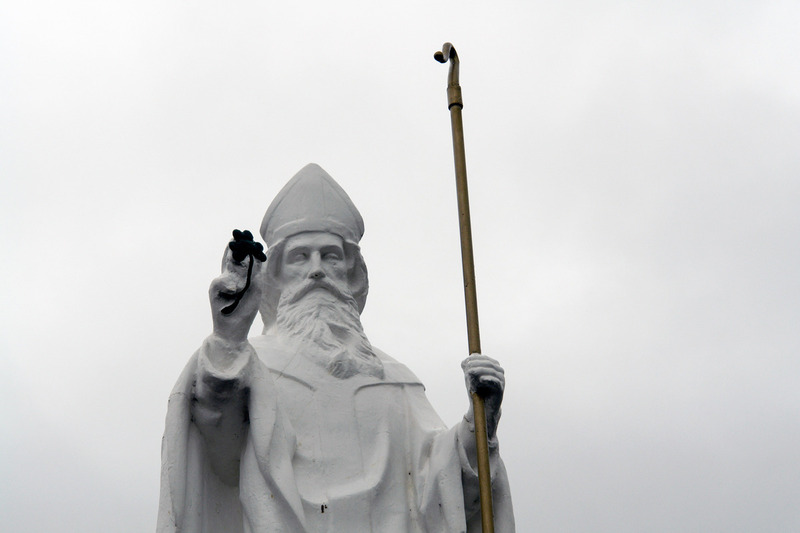 A statue of St. Patrick at Croagh Patrick mountain, a Catholic pilgrimage site in Ireland. As Americans prepare to observe St. Patrick's Day with pub crawls, parades, corned beef, and green clothing, beer and bagels, let's not forget about that country for which Patrick is a patron saint. Irish bishops in Nigeria named St. Patrick, who is said to have died on March 17 in the year 461, as the country's patron in 1961, the same year Ireland opened its embassy in Lagos. The Irish actually have a long history in the country: Irish nationalist Roger Casement — executed in Dublin in 1916 for his role in the Irish rebels' Easter Rising — served as a British consular officer in Calabar, in southeastern Nigeria, during the 1890s. Casement's interest in and sympathy for Africans under colonial rule was unusual for a European in the Victorian era, and likely helped shape his views on social justice. In the early 1920s, Irish priests of the Order of the Holy Ghost established their mission in southern Nigeria. Later St. Patrick's Society for Foreign Missions, dedicated on March 17, 1932, became one of many Catholic groups in Nigeria providing education both religious and secular. These days Catholics in the country number some 20 million, and Nigerian seminaries send their ordinates all over the world to serve as priests. In fact, since numbers of clergy in Ireland have long been in decline, Nigerian priests have recently been assigned to churches there. Though St. Patrick's Day is not an official public holiday in Nigeria, plenty of Guinness stout will be consumed anyway. It's the second most popular beer in the country, brewed with sorghum or maize instead of the European recipe's barley, and packs a 7.5 percent alcohol content. And "Irish diplomats of course celebrate St. Patrick's Day," says Eoghan McSwiney, deputy head of mission at the Embassy of Ireland in Abuja. "The Embassy organizes high-profile St. Patrick's Day celebrations in the capital Abuja, and in Lagos, as well in Accra, Ghana. We are joined by friends and colleagues from the diplomatic corps and from the highest levels of the Nigerian public and private sector." There is one big difference from American St. Patrick's Day celebrations, though, and it's not green bagels. In Nigeria, says McSwiney, "We don't organize a parade."